This page is a great place to start with gift card and money type freebies! I love a little extra cash, don’t you? I am personally a member of all the sites I’ve listed here and love them. Also, I’ve filtered out the junk for you such as the sites that run you in circles and you don’t get anything much for your time, because I can’t stand sites like that and I know you don’t either. Just visit the ones I listed below, sign up for a free account and be sure to fill out your profile and connect your social media accounts. It’s basically like finding found money! In my opinion this definitely falls under the category of FREE! Swagbucks – You earn Swagbucks when you shop, watch videos, play games, answer surveys, search the web and more! Plus, you even earn up to $5 per friend that you refer. 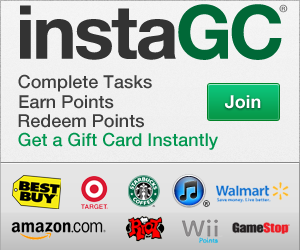 InstaGC – This is another really cool site for getting free gift cards! A friend sent me the link and once I signed up I never looked back! This site really pays too! Honey Browser – I LOVE this one! It’s a browser extension that you add to your browser and forget about it! You do nothing extra but when you go to make an online order it pops up when you get to the checkout page and automatically searches for a coupon code for you. If it finds one it applies it for you and you literally see your total drop before you check out! It’s helped me out a lot! Buzzoole – This is a pretty cool site because you get rewarded with actual Amazon gift cards which is nice because Amazon sells everything from toys, clothes to groceries! You can also earn credits which are cashed out for Amazon gift cards.